I knew this time I wanted things to be different. I had been doing my research to find out that I can have a vaginal birth after having a cesarean section. However, everything I had read and the support groups I had found lead me to believe that it was going to be a daunting task to be able to have that birth that I have always wanted. The pain (I have heard about) of birth never scared me. I have always imagined having a natural drug free birth experience for my children. Upon finding out that we were finally pregnant again I had set up an appointment with the same doctor I had for Pickle’s pregnancy, birth, and our fertility issues. I figured, at a minimum, she would at least establish that I am indeed pregnant again and whether or not I would get what I want this time. My appointment was not scheduled until I was around 8 weeks pregnant. Unfortunately, we made a trip to the emergency room sooner than that. I woke up on the 19th of May to go to the bathroom in the middle of the night roughly 230am. When I wiped there was blood on the toilet paper and I immediately went into a panic. I had heard so many stories about miscarriages and chemical pregnancies I knew I was not invincible to that happening. I woke up my husband to let him know he needed to take me to the emergency room. We let my mom know and then we left. We got to the emergency department and they admitted me. They did a pelvic exam and ultrasound and all they could tell me was the heartbeat was on the low side. They wound up giving me threatened miscarriage pamphlets along with my discharge papers that said to get into my regular doctor right away the next day. Later that morning, I called my doctor and they wanted me to come in for another ultrasound. We went in and during the ultrasound the technician was much more friendly than the one at the ER and explained that I had what is called a subchorionic hemorrhage; which is basically a pool of blood in the uterus. The heart rate was 108 beat per minute and they measured the little bub at 5 weeks 5 days. My doctor prescribed me progesterone to help aid the pregnancy until the placenta would take over in the following weeks. She also wanted to have me come back the next week to see how things were going. That following week we went in to check on baby. The heart rate had gone up to 134 beats per minute and the hemorrhage was pretty much gone. What a relief! We went to my first official pregnancy appointment in June and they did another ultrasound. The hemorrhage was completely gone and baby was measuring right on schedule with a heart beat of 176. We decided to go to this elective ultrasound place that does gender scans to find out what we were having. Originally we were going to keep it a secret and then surprise everyone, but then my mom had offered to pay for the ultrasound with the stipulation that only she would get to know the gender and then we would do a gender reveal party. We agreed to go ahead with the party because it was more exciting! We did the ultrasound around 16 weeks. I was sitting with a towel over my face so that I could not see the screen and ruin the surprise. No body was allowed to look and the technician printed out the gender and put it in a sealed envelope. My mom did a really great job at keeping the gender a secret for a couple of days until the party. At our gender reveal we found out we are having a girl! I really thought we would be having another boy. We are thrilled! It was around that same time that I had an appointment with my doctor and discussed my birthing options with her. 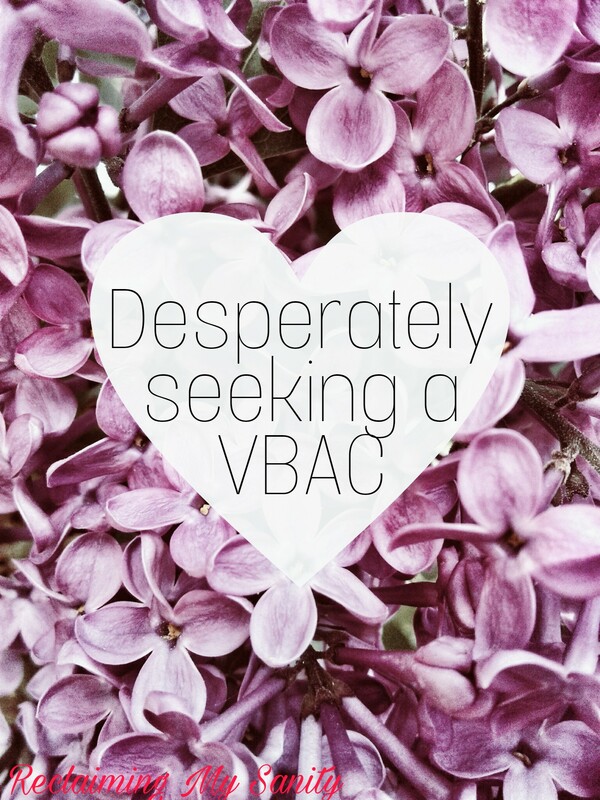 She told me she didn’t mind me “trying” to have a vbac,but I did not feel like I could trust her given the history we had with her jumping the gun to fit her schedule. With all the research I had done and the support groups of women who had vbacs here in town we decided to transfer my care to the University Hospital with the Midwives. So far they have all been really great! We only ran into one issue. During my anatomy scan, everything went fine and you always meet with an OB/GYN afterwards to discuss anything. Keep in mind this is the first ultrasound we have had with the new providers and the first time meeting this OB/GYN. He said while everything looked good with baby that I would need to come back for monthly ultrasounds to measure growth because of my insulin resistance and being overweight. RED FLAG! I went ahead and scheduled one ultrasound with the intentions of discussing the necessity of it with my midwife at my next appointment. I went to that appointment ready to let someone have it as I know my rights and I know the red flags for those that are not vbac friendly. I explained to the midwife that it was not fair to treat me as a diabetic especially considering the fact that I had not taken the glucose test yet to see if I even had gestational diabetes. Gestational diabetes is not quite the same as insulin resistance. Unfortunately, the midwife I had that day was not very considerate or agreeable to what I was saying. She told me to trust that doctor because he “is very good and knowledgeable.” I kept telling her that I was not comfortable with that because nothing has been problematic thus far to warrant the need for the ultrasounds. I also added that insurance does not cover all of them. I agreed to one more ultrasound and then no more unless my glucose results came back that I did have gestational diabetes. At my next ultrasound, luckily it was a different doctor that came in afterwards. I explained to him my concerns and how I felt like they were being prejudice against me for being overweight. He agreed with me in saying that I would only need one more ultrasound if I pass my glucose test. If I did fail then I would need monthly ones to measure growth. I complied. So last month I went and did the one hour glucose test. I was very antsy for my results as I knew that would change the direction of things a bit and make a vbac harder to get. Unfortunately, I failed the one hour test by 4 points. 4 points, really! So I had to do the dreaded 3 hour test where you cannot eat for 12 hours prior to the blood draw. So you starve yourself for 12 hours, go in get your blood drawn, then they give you the glucola drink and you have to wait an hour, blood draw again. Then wait an hour, blood draw again, and then wait another hour and blood draw again. It is a length hangry process. However, I passed! So I have been determined not to have gestational diabetes and can enjoy my pregnancy. At my last appointment, I signed my VBAC consent form. I am ecstatic to have a team that is helping me to achieve the birth that I want. I am currently 31.5 weeks pregnant and baby girl is still measuring right on time. At my last ultrasound she was measuring 3 pounds 10 ounces. We are very eager to meet her and I can’t wait for the birthing experience this time around!